The Class of 2015 features 15 restaurants, 1 resource, and 2 hybrids. This is the largest class since the Class of 2012, which featured 19 GNRs, and it stretches the boundaries of the program in many ways. Publican Quality Meats was nominated not only as one of the finest butcher shops in the city, but also as a fantastic sandwich shop – making it worthy of being awarded as both a restaurant and a resource. Similarly, while most think of Kaufman’s Bakery & Deli as a place to pick up bagels and lox or a deli tray, it also turns out a terrific corned beef on rye to sit and enjoy for lunch. Wells Brothers, known for their first rate tavern-style thin-crust pizza, is the first GNR that resides solely in the state of Wisconsin (Spice House, Class of 2009, has two outposts in Milwaukee in addition to three in Illinois). Fresh Farms in Niles is the first supermarket to be awarded, but earned its spot with an unmatched selection of imported products and superb customer service that makes shopping there a personal experience. West Rogers Park was popular this year with Taza Bakery and Gogi joining Katsu (2005) and Argo Georgian Bakery (2009) to make the area around the intersections of California with Devon and Peterson a hotbed of great ethnic eats. Lately, GNRs have seemed to cluster, with Elizabeth a couple doors down from Rainbow Thai (2014); New Asia a short walk from Nhu Lan (2009) and Monti’s (2013); Jimmy Jamm Sweet Potato Pies just down the street from Top Notch Beefburgers (2008); and Bien Trucha a mere few blocks from the Spice House location in Geneva. This year’s GNR nominations were particularly interesting due to their connections to previous GNR cycles. Gogi opened up in the same storefront that used to be Hae Woon Dae (2006). Publican Quality Meats is the third member of Paul Kahan’s One Off Hospitality Group to be awarded a GNR, joining avec and The Violet Hour, both class of 2008. The original Redhot Ranch location on Western (2012) is now joined by the Ashland location. Taza Bakery was previously nominated in 2011 and found its support this year. The GNR Committee, made up of 11 longtime members, faces the challenging job of determining which nominated restaurants and resources enjoy what we consider “board consensus.” We start by finding every reference on the board to the nominee in question. Then we evaluate the posting history to determine if the posts are predominantly positive and if there is enough interest to constitute consensus. This year, as every year, we were faced with some difficult decisions. Athenian Room was first nominated in 2008. At the time, mixed reviews and a lack of a dedicated thread meant the nomination fell short. A dedicated thread was started a couple years ago and some recently renewed enthusiasm inspired a renomination. Board members lauded their timeless charm and terrific skirt steak while a few detractors spoke up to question their consistency. While the negatives were few, the GNR Committee felt the positive support was too weak to be labeled as board consensus. Cross-Rhodes, a very similar restaurant with some shared history, proved that there is love for Greek-American classics on the board. The closest call in this year’s GNR cycle was Andy’s Thai Kitchen, my nomination. Andy Aroonrasameruang’s cooking has long been a board favorite dating back to his days as chef at TAC Quick (2005). In 2012 he left TAC Quick to open his own restaurant and immediately reports of visits to the new outpost came pouring onto the board. Early reviews were mostly positive, though there were mentions of growing pains, and eventually the board discussion quieted down. Most recent discussion was positive, but some posts mentioned both highs and lows and service issues seemed to plague them. After the restaurant was nominated, additional voices shared the opinion that Andy’s Thai Kitchen is not serving Thai food at the same level as other board favorites. The GNR Committee was torn. Andy’s history and long record of board support was compelling, but there were too many that felt Andy’s food was no longer as special as it once was. After all was said and done, another great Class of GNRs has been awarded. The list now has over 150 restaurants and resources, guaranteeing that you’re never far from great food. Though nominations and discussion take place in February and March every year, the conversation continues all year long. This dimly lit Logan Square bar features a friendly, comfortable vibe, one of the most creative cocktail programs around, and a Cajun-inspired menu that would stand out even in New Orleans. 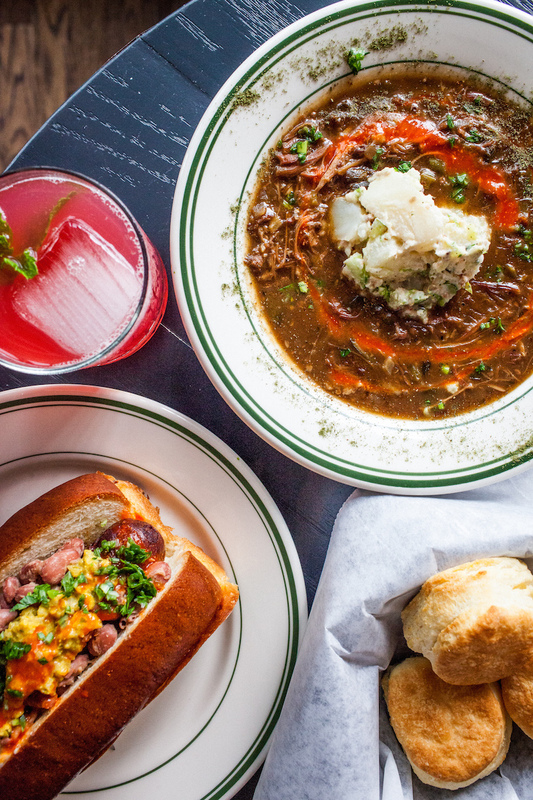 From the expertly crafted cocktails and purls, to house-made charcuterie and condiments, to the arguably best-in-town fried chicken and biscuits, Analogue has it all. With its cozy, yet hip, bar-like atmosphere, this modern Mexican bistro in Geneva is known for spicy salsas, classic margaritas, and some of the best fish tacos anywhere. But don’t stop there. Try the decadent cazuelita de camarón: briny shrimp in a bath of queso, gilded with a tart, herbaceous cilantro chimichurri. This simple yet elevated approach to Mexican fare makes Bien Trucha a one-of-a-kind gem in the area. Some of the finest, flaky French-style pastries in town can be found in Logan Square at Cellar Door Provisions. Croissants are deeply browned and studded with butter churned in house. Biting into a morning bun showers your plate with shards of crisp, buttery flakes as the cinnamon hits your palate. Beyond the delicious pastries, CDP slings some of the best artisan bread in Chicago, and a small, constantly changing breakfast and lunch menu of well-crafted, seasonal fare. Cross-Rhodes is what every Greek diner aspires to be: solid Greek staples, reasonable prices, and efficient, friendly service. Favorites include the Greek salad topped with gyros and plentiful feta, and the perfectly char-grilled burger. But the marquee offering – drawing customers back over decades – is the Greek fries: thick-cut, impossibly crispy fries doused in an herbaceous, lemony vinaigrette. Eat a few right away, then enjoy the rest after they’ve soaked up the tangy sauce. Passionate forager-chef Iliana Regan – whose prior venture was a single-table restaurant in her apartment – serves inventive, seasonal, and artistic dinners in an intimate Lincoln Square dining room. Both serious and whimsical, the evolving tasting menus have included a terrarium with yellow watermelon, uni ice cream, bear rice crispies, and a shrimp noodle. Service is top notch, wine pairings are thoughtful, and reservations are a must. For excellent, wood-fired pizza in Chicago’s far Northwest corner, try Forno Rosso in Dunning. Fans cite the stellar, lightly charred crust and interesting toppings, each clearly demonstrating the great pride taken in sourcing only the very best ingredients. You’ll be treated like family while you sip an Italian draught beer and admire the beautifully tiled, wood-burning pizza oven smoldering away at 1000 degrees. Buon appetito! If you had to pick one grocery store to go to for the rest of your life, Fresh Farms should be the one. It’s like a giant version of your favorite ethnic market, or all of your favorite ethnic markets combined, featuring one of the best delis in the city, a huge and well-priced produce department, a busy fish counter, and a large, European-focused bakery. Well worth exploring, you never know what you’ll discover next. Gogi is a cut above the rest for Korean BBQ, with high quality meats, excellent service, and real charcoal grilling at the table. This is destination Korean food; a place you can bring more conservative eaters ready for grilled kalbi, or adventurous eaters looking to enjoy a seafood pancake or Gogi’s wide array of kimchi and other banchan. Jimmy Jamm Sweet Potato Pies’ focus on one humble root vegetable is highlighted deliciously in every slice and spud preparation. Jimmy Ferguson’s shop serves up pie from her father’s recipe, as well as loaded sweet potatoes, sandwiches on sticky sweet potato bread, sweet potato ice cream, and more. The friendly service and made-from-scratch menu are just icing on the sweet potato cake. Kaufman’s in Skokie is the definition of North Shore Jewish delicatessen: great bagels, bread, lox, corned beef, chopped liver, and classic cookies. We thought we lost them after a fire, but they came back stronger than ever, with a new eating area and better flow. Stop in for a sandwich on Chicago’s best corn rye bread, pick up a deli tray, or grab fixin’s for a brunch the whole family will love. MANA is a vegetarian restaurant where you don’t miss the meat. No vegetable-based substances dressed up to look like meat, just well-conceived and well-executed food. A small, beautiful place to spend an evening drinking and having small plates, with chef-driven food drawing from Asian, European, Latin, and American flavors. Whether it’s curry, tamales, house-made pickles, or pierogi, there’s plenty for everyone. New Asia, an unassuming little hole-in-the-wall, stands out from other local Vietnamese restaurants, not only for its distance from Argyle Street, but in the freshness of its ingredients and hearty, country-style Vietnamese comfort food. Feast on bowls of oxtail pho, beef with mustard greens, and goi ga – a chewy yet moist chicken salad chock full with herbs, cabbage, and peanuts. This is Vietnamese for the Vietnamese; welcoming all to experience what this exciting cuisine has to offer. Everything is made from scratch with imagination and commitment at Publican Quality Meats, a showcase of the best that carnivores and herbivores can source and craft in Chicagoland. Sandwiches are a collision of unctuous grilled meats and crisp slaws and relishes, salads a curation of area farms, and soups and stews redolent of pulses and good olive oil. House breads and cookies are noteworthy, and chorizo, chops, and porchetta are highlights to go along with shelves stocked for thoughtful shopping. Redhot Ranch builds on the best tradition of Chicago hot dog stands – natural casing dogs, crisp hand-cut fries, deft handling of condiments and customers – with addictive, homemade fried shrimp, and a signature griddled burger that compares favorably with the offerings of both the chef-driven pubs and most coveted national chains. The crisp-edged, well-seasoned cheeseburgers are one of the city’s great values and true delights. Spicy Thai Lao takes the taste buds by storm, its sour and crisp and herbal sensations creating paths in your brain that force your body to travel south from any part of the city. Take the turmeric-tinged eggrolls with scratch peanut-studded dipping sauce. Are these the best in town? Fresh som tum and other salads bring a nuclear-level heat if you request it, and the contrasting textures in the beef pad tamin can’t be replicated anywhere else. Even in a cozy space, Sportsman’s Club expands the horizons of what a great neighborhood bar can be. They retain great talent, with a knowledgeable team preparing an ever-rotating menu of four perfectly balanced cocktails and amari along with their signature ode to bourbon, and equally happy to sling a High Life and whiskey shot in the comfortable surrounds. The menu is secondary only to the gathering, where thoughtful music, friendly games, and an open mind to community causes carry the day. Taza Bakery is a portal to the Middle East; the sun rises in everything coming out of their ovens, from stellar flatbreads to substantial samoun to fragrant spinach pies. As good as they are with doughs, they excel with spreads, from herbaceous zaatar to the sweet roasted flavors of muhammara and lemon-drenched crumbles of soujouk sausage. Shawerma is beautifully charred and moist, and pairs so well with fresh-squeezed juices, yogurt, and honey-rich kanafeh. Whether carryout or dine-in under the gaze of the bakers, Taza is freshly savored. Wells Brothers has a crust, sausage, and welcome that is collectively so good Chicagoans cross the border by carloads to embrace it. Start with a caramelized house sausage and tangy-crisp giardiniera – order it well-done if you like, though they may give you the business – and you will understand the allure of the “tavern thin” pizza archetype. True Wisconsin mozzarella-blanketed antipasti is a throwback worth the drive, and you might find a game of cribbage as well.